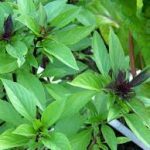 Sow Basil seeds, whatever variety, in individual plugs, one seed in each, one seed’s depth. 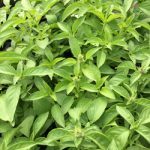 This method of sowing will give you a large basil plant. Sow from mid May, preferably in June and also in July. As soon as the seedling has two good leaves, and as soon as any roots show through the base of the pot, do not delay in potting the plant on. Pot on to a 7cm pot using John Innes No 1 type of compost mixed with multipurpose compost. 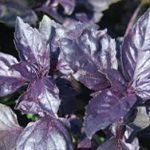 Grow on the Basil plant in full sun and as much warmth as possible. Water first thing in the morning onto the soil in the pot, without wetting the leaves. Check the watering every other day. Give adequate water, but do not waterlog. Never leave the pot standing in water. If you forget to water one morning, do not water in the evening, but wait until the next morning. Remember that Basil grows well in countries that do not have such a fall in temperature in the evening as the UK. If growth slows down, feed once in this size pot, with a seaweed-based organic liquid fertiliser. Pot on finally to a large pot of 23cm diameter, slightly smaller for Greek Basil. Use a John Innes No 2 type of compost mixed with multipurpose compost. If there is no danger of a late frost, harden off the plant by placing it outside during the day, and bringing it in at night. Repeat this for 4 to 5 days. Place permanently outside from mid June onwards. Find a sunny spot, completely sheltered from the wind, but not too close to a wall or a fence. Place the pot on a garden table or on another large pot upturned. This will ensure good drainage and will be above slug level. Basil grown outside in this way is not troubled by whitefly and is better ventilated than in a greenhouse. 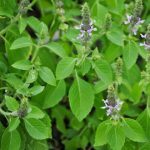 Stop the Basil plant from flowering by harvesting often. Use scissors to snip whole sprigs from the tops of shoots, rather than pulling off individual leaves. Water every other day depending on the weather. Keep harvesting and give a weekly organic seaweed feed. 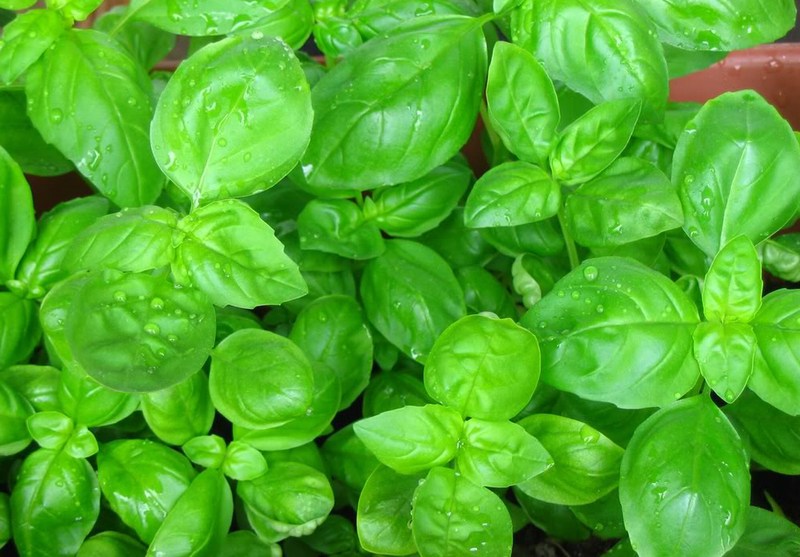 At the end of September bring the Basil plant indoors and place it on a sunny windowsill. There should still be enough leaves to pick off it for another month. 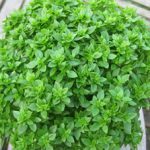 Basil is grown as an annual in the UK, so when it is finished with by November, put it on the compost heap, and start a Basil again the following spring. There are many different Basils to try with many different flavours for different dishes, but all require the same growing conditions.